I am going to explore the relationship between liquidity traps (LT) and what I called information traps (IT) which manifest similar phenomena. The original meaning of the liquidity trap is a horizontal demand curve for money at some interest rate. In Keynes' work, it was possible for this to happen at any interest rate, however later work purported that this could only happen at the zero lower bound (interest rate r ≈ 0). 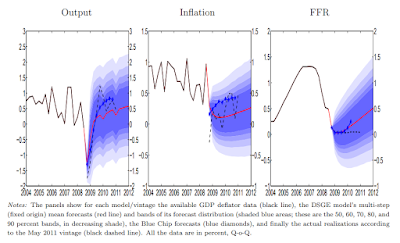 As there has been no evidence for an economy experiencing a liquidity trap at r > 0 (even during the Depression, rates were near zero), the economic consensus is that the liquidity trap and the zero lower bound problem (ZLB) are one in the same. It turns out Keynes' original formulation is more accurate in the information transfer framework; LTs can happen at any interest rate -- it's just that past experience makes us think LT and ZLB are the same. 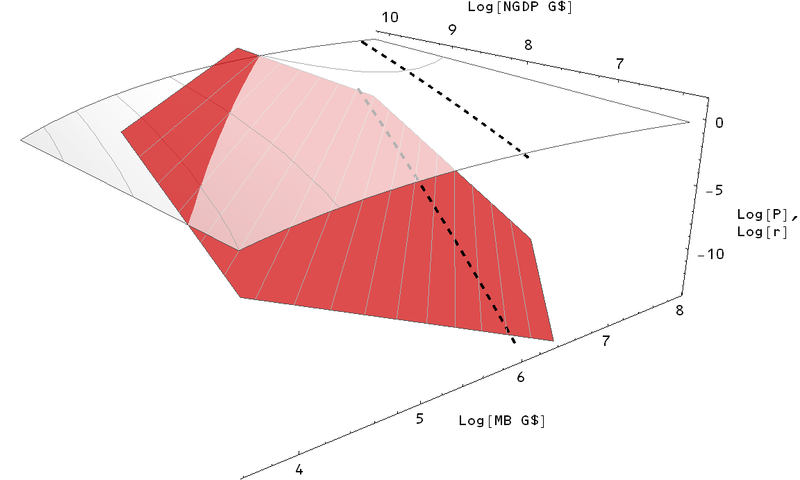 The level curves of the red surface (constant interest rate) are plotted in red, two lines of constant information transfer index are plotted in black along with the information trap criterion (dashed). The modeled path of the US economy (from the graph at the top of this post) in the space is plotted in dark blue with a few years indicated. You can see that the relative size of the monetary base that leads to an information trap gets smaller as the economy (NGDP) grows (for a larger NGDP, a larger MB is necessary to be in an information trap but MB/NGDP decreases). According to the information transfer model, interest rates are always "low" when you're in an information trap, but "low" is a relative term. From the 1960s until the present, you had to have interest rates below 1% to be in an information trap. In the 1970s the rate had to be below ~ 0.01%. 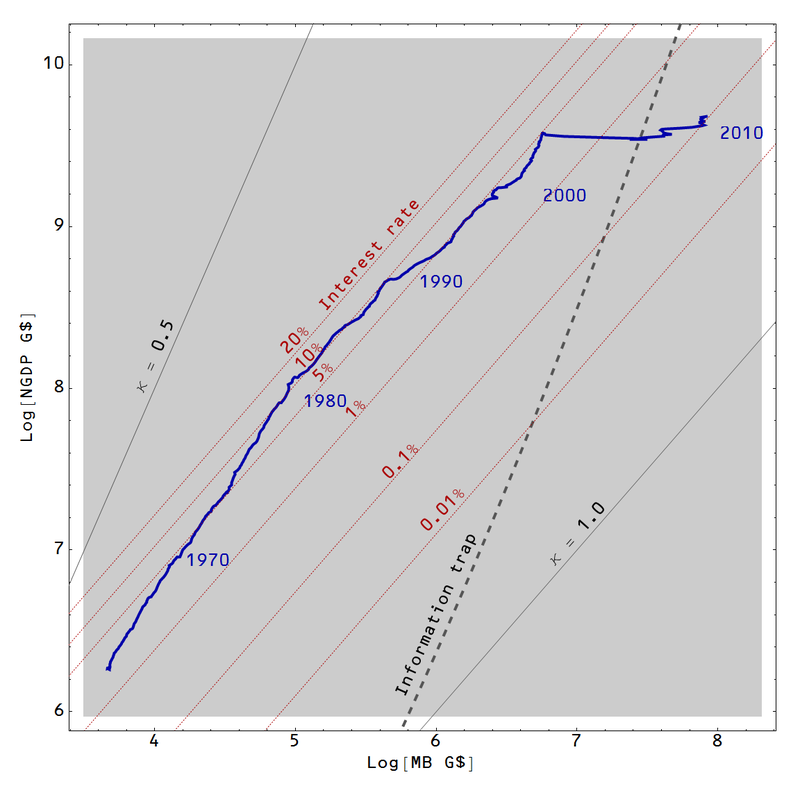 Starting in the 1990s, an interest rate below 0.1% became sufficient (the current August 2013 effective Fed funds rate is 0.08%). The information trap rate will reach 1% when NGDP reaches about 22 trillion dollars. Note that the validity of the interest rate model may not reach such low interest rates, so at best we can say is that the information trap interest rate has been r ≈ 0 and will not become large for quite some time. 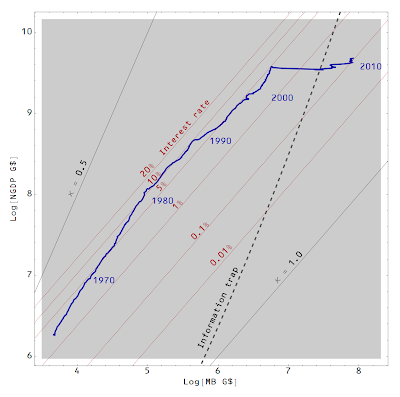 Therefore, ZLB ≈ LT ≈ IT for now but it is theoretically possible for LT ≈ IT above the zero lower bound representing a flat money demand curve at non-zero interest rate as Keynes' originally formulated it. PS An upcoming post will reproduce this graph in the case of Japan. Jason, this is great stuff. I suppose I can find out the justification for drawing the price level surface the way it is elsewhere on your blog? I'm only getting a fraction of what you're saying, but this is very intriguing. BTW, here you used MB on the x-axis, but in your recent post you changed it to M0 (which I don't think exists in the US). Why? "M0: The total of all physical currency including coinage. M0 = Federal Reserve Notes + US Notes + Coins. It is not relevant whether the currency is held inside or outside of the private banking system as reserves"
It's too bad (if Sadowski is right), because M0 was handy for that. Well, you tell me: what do you mean by M0? "Here for example are the Japan and the US model calculations using the currency component (sometimes referred to as M0):"
"Notes and coins in circulation (outside Federal Reserve Banks and the vaults of depository institutions) (currency)"
"Notes and coins in bank vaults (Vault Cash)"
"Federal Reserve Bank credit (required reserves and excess reserves not physically present in banks)"
1. "in circulation" includes inside bank vaults according to the Fed. "M0: The total of all physical currency including coinage. M0 = Federal Reserve Notes + US Notes + Coins. It is not relevant whether the currency is held inside or outside of the private banking system as reserves." ... er... I should say *was* correct about Japan!... I could swear that just recently they had "M0" for Japan, defined as notes in coins held by the public, but not in bank vaults. Sadowski even confirmed that was true. The UK said M0 was notes and coins in circulation (including bank vaults), but they don't use that anymore (Frances Coppola confirmed that). If you're interested I can get the link to my thread with Sadowski about this. We also confirmed that IOR is not paid on vault cash, even if it's used to count towards meeting reserve requirements. I ended up asking David Andolfatto (of the St. Louis Fed) some of these basic questions... and he in turn passed it on to a colleague there... who, BTW, still ended up getting at least one of my basic questions wrong (Sadowski pretty convincingly pointed out). for the price level. The "base" including reserves is still used for the short term interest rate, while the currency component (i.e. without reserves) is used for the long term (10 year) interest rate. Overall, the idea is to avoid a measure that includes cash created by fractional reserve banking and focus on physical notes and coins, regardless of where they are located (vaults, or in circulation). And yes it is a nightmare to get apples to apples comparisons. Vault cash can be used to meat reserve requirements, and if fact is counted as reserves when this is done. A high percentage of vault cash (~90%) has been counted towards meeting reserve requirements since 1959 when this was first allowed, and in fact this cash is part of "reserves." However, it's not part of "reserve balances" which are bank Fed deposits (bizarrely enough, up till 2011 there was a kind of bank owned Fed deposit which was not considered "reserves"). Currency is sometimes defined as paper notes only, but many Fed documents include "coin" in with "currency." (The FDIC tends to keep them separate and uses the term "cash" for both). "Currency in circulation" includes currency held by the non-bank public as well as vault cash. The UK used to call this M0, but they no longer keep track of that. The US just calls it "currency in circulation." Japan used to (apparently) call currency held by the public (but not vault cash) "M0." So when you say "currency component (i.e. without reserves)" how are you counting vault cash? That's part of "currency in circulation" and it's also part of "reserves." What is "cash created by fractional reserve banking?" Cash, AFAIK, is "currency and coin" (FDIC) = "currency" (FED): i.e. it *is* physical paper notes and coins. Do you mean "checkable deposits" ... sometimes called "transaction deposits?" It sounds like the answer is "yes." OK, what you had been using is "MB" but now you are using "currency in circulation" the definition of which corresponds to the old UK definition of M0. No need to answer all my questions above... it's pretty clear! Thanks. Does this argue for reducing the size of MB to try and get back into the "untrapped" region? "for a larger NGDP, a larger MB is necessary to be in an information trap but MB/NGDP decreases"
This seems very strange to me. Because MB is a nominal quantity of money, right? MB/P would be a "real" quantity, wouldn't it? 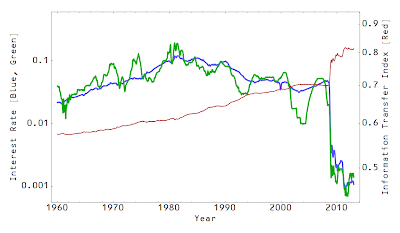 So you have the ratio of two nominals (MB/NGDP) which is "real," right? Obviously I have to do more reading. Here's what I don't get: suppose by presidential decree, the penny were made the new UoA tomorrow: The decimal place on all debts, contracts (including wager contracts), and prices just shift two places to the right, but otherwise nothing else changes. I don't see how that affects anything, but on your chart couldn't that shove a country from non-information trap status to information trap status? Actually it depends on what you want the role of the central bank to be in the economy -- if you want the central bank to control the economy, then moving back is a solution, but so is a bout of hyperinflation. If you'd like fiscal policy to be the primary tool of demand management, then the information trap represents an ideal situation. Regarding your sub-comment -- such a change would change not only the quantities like NGDP and MB, but the dimensionful coefficients in the model (which have units of dollars). The result would be no change.